In possibly the UK’s first arrangement of its kind, Library and Learning Services is delighted to announce the appointment of Professor Charles Oppenheim as Visiting Professor to the department. Professor Oppenheim has had a distinguished professional and academic career and is an internationally recognized expert in the areas of Intellectual Property Rights and scholarly publishing. We are looking forward to benefiting from his expertise in a number of ways. In addition to delivering an annual lecture or workshop on his areas of specialism, Professor Oppenheim will provide academic leadership and mentoring to LLS staff engaged in research activity and will play an active role in the research life of the department. Your first opportunity to hear Professor Oppenheim speak will be when he opens the forthcoming LLS Conference. The programme for this will be published shortly. Watch this space. Charles Oppenheim was, until he retired in 2009, Professor of Information Science and Head of the Department of Information Science at Loughborough University. He is currently a Professor at Robert Gordon University, Aberdeen, and a Visiting Professor at Cass Business School, part of The City University, London. Previously he held posts in other academic institutions, and in the electronic publishing industry. 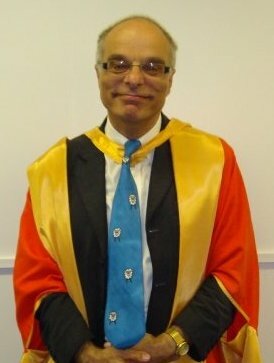 Charles is an Honorary Fellow of the Chartered Institute of Library and Information Professionals. He has been involved in, given talks on, and published on the library and information professions, Intellectual Property Rights and other legal issues relevant to the library and information professions, bibliometrics, evaluation of research quality, and on scholarly publishing trends. He has published well over 400 journal articles, more than 60 conference papers, more than 50 reports and has written about 10 books in professional subjects. His recent Facet book, “The No-Nonsense Guide to Legal Issues in Web 2.0 and Cloud Computing” has received very positive reviews. He received both the Jason Farradane Award for services to the information profession, and the Aslib award for lifetime achievement to library and information science in 2013. Posted on March 21, 2014, in Library, News and tagged Library and Learning Services, Research, visiting professor. Bookmark the permalink. Leave a comment.